Osh, South Kyrgyzstan. In the morning of June 12 the group of armed men and APC showed up in the Uzbek residential district, called by Teshik-Tash (Holey Stone). The district is located along the Lenin street, close to Shaitube micro-district (Shaitube is russified name of the district. In Kyrgyz it is Sheit-Dobo while in Uzbek it sounds as Shahid-Tepa – editorial note). 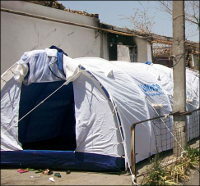 Today, the side walkers can only observe the tents, set up along the parched houses. Not all owners of burnt houses dare to stay overnight there; many people stay with relatives overnight and come back for the day time. There is nothing to do here. People are just waiting for someone to finally come here and tell them where they are going to live. On one side of the street, the burnt two-level house is located right behind the philharmonic. On the opposite side the ruins are observed behind distillery. 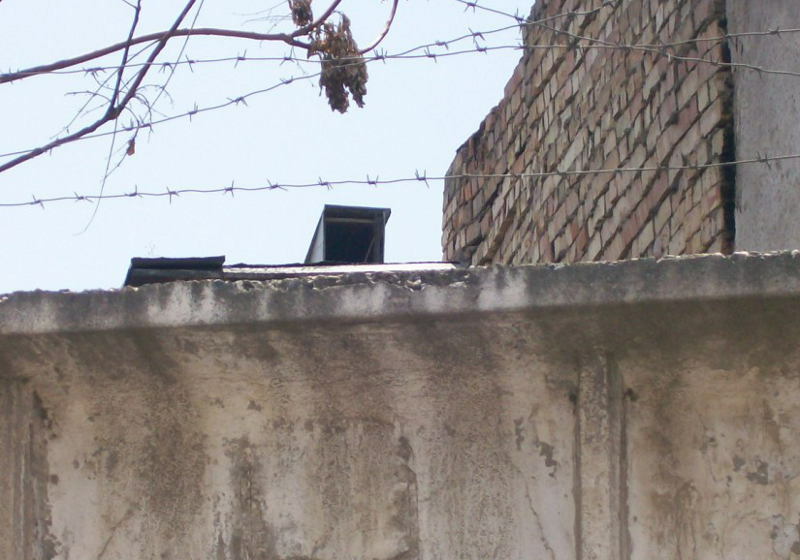 Small Street of Bakhramov is located behind its body, hidden by big fence and barbed wire. Once I grabbed my camera I got immediately surrounded by four women; later on few more women joined in. These are local dwellers. They started talking to me (the chins of some of them were trembling) and crying…They are afraid to tell their names. - I put my best efforts here. Everything was in order here. It was beautiful. My favorite cherry tree was burnt…We used to host guests. It was not bad life at all. We caused harm to nobody. This area had regular, not expensive houses with small rectangles, where the hard-working owners usually built two small houses – for themselves and for their kids and grandchildren. Very small area was allocated for trees and flowers. Eight houses were burnt at Bakhramov’s street. The white tent, hosting 7 family members, was erected in the corner, near brick fence, hiding the remains of the walls. The owner says the house was here and they also built small dining-room. According to her, Kyrgyz people loved to come here, because it was very comfortable and not expensive place that offered delicious food. It is all gone now. The winter is coming up. They are not offered new places, not getting construction materials, not even allowed to clear the debris and rebuild the houses. "Perhaps, they want to raze everything to the ground and erect their buildings here – women say. – TV programs do not show our houses. Our officials accompanied the foreigners to the devastated five-storey building as if we do not exist at all"
One old man asked us when the local residents will be provided with free medical aid that was promised by the government. He says the medical services are expensive while they have no jobs. "When are the government officials going to visit us? They promise to provide housing before winter, but they are not even coming here. 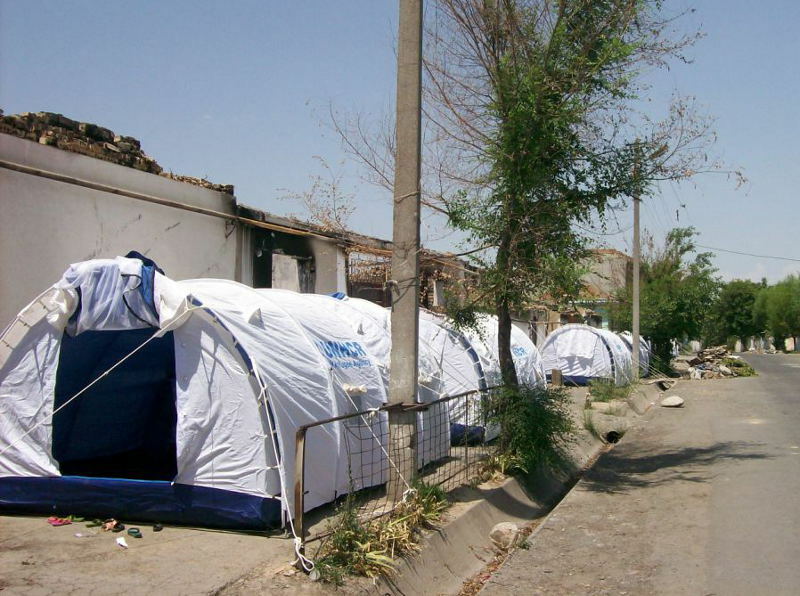 Only international agencies help us with tents and food, but they are not going to build houses for us…"
In the morning of June 12 the locals heard the noise, shouting and shots. They immediately headed towards Kurmanzhan datka streets, leaving money and documents at home. On that day women and kids did not come back. They headed to Sary-Tash refugee camp. Some were lucky to take car there while others walked. Many men were protecting homes. 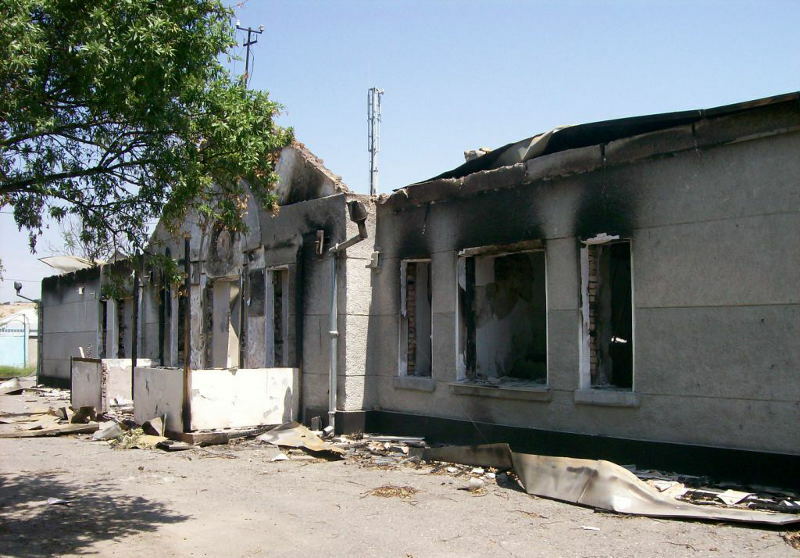 According to local dwellers, 17 people were killed in the Teshik-Tash area. They are affirmed some of them were killed by the sharpshooter. The residents even showed the place where he was hiding – the attic window at the roof of the distillery. 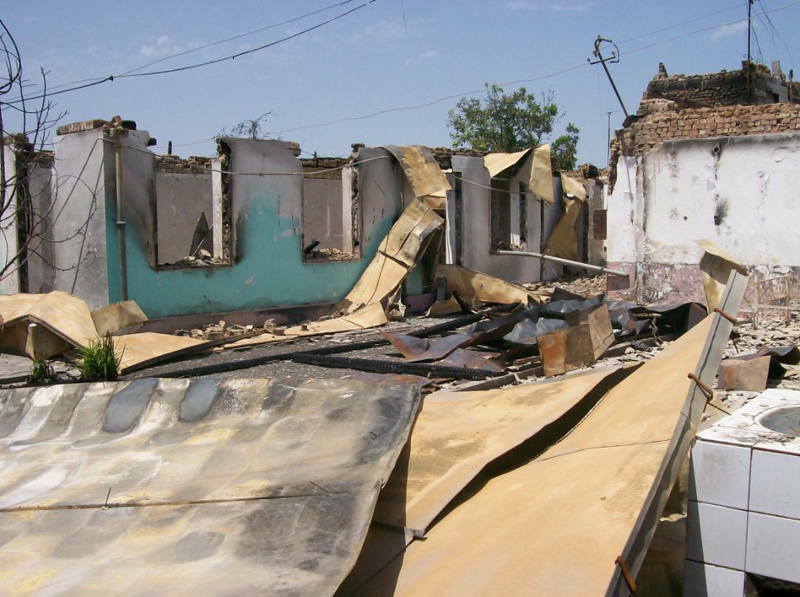 Besides 8 houses at the Bakhramov’s street, another 73 houses and 17 buildings were burnt down in Teshik-Tash along Lenin’s street. 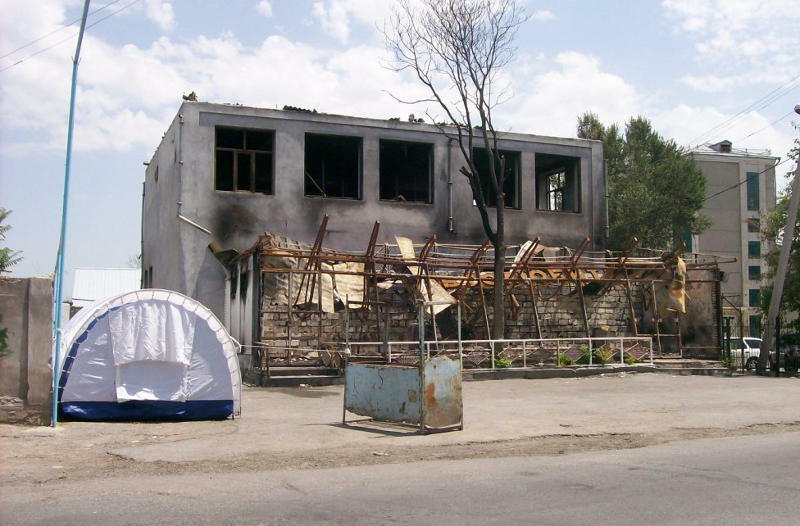 The looters destroyed even the center for adaptation and rehabilitation of underage children (under Osh Oblast internal affairs department). On that horrible day one family was staying home in Teshik-Tash. It was having tea in the morning. The son of Khikmatullo came from Russia with family. Nearly 20 armed men were breaking in. Khikmatullo was trying to talk to them and even offered tea. In response, he was wounded in his hand. The uninvited guests looted the house. Mavluda, the wife of Khikmatullo, was trying to defend her property; as a result, her arms were also wounded. - We do not know what they did to their two daughters. The witnesses say it was scary to look at young women. Good thing they all survived. Entire family was taken out of the looted and burnt house. This family was also seen in Sary-Tash; Khikmatullo was sent to the Andijan hospital. Later on they moved to their son’s place in Russia.